The developers of Grand Theft Auto 5 sure know how to make an open world game fun as it is just filled with so many activities and things to do. One of the things I like doing is stunts around the large map and so we’re going to take a look GTA 5’s awesome stunts. There are at least 45 specific stunt jumps hidden around the map and so it can be fun trying to find them all. There are a few of them that I really like in the city one of which is at the Los Santos International Airport. One thing that is nice too is that you can make your own specific stunts with so many places to jump off of in the game. 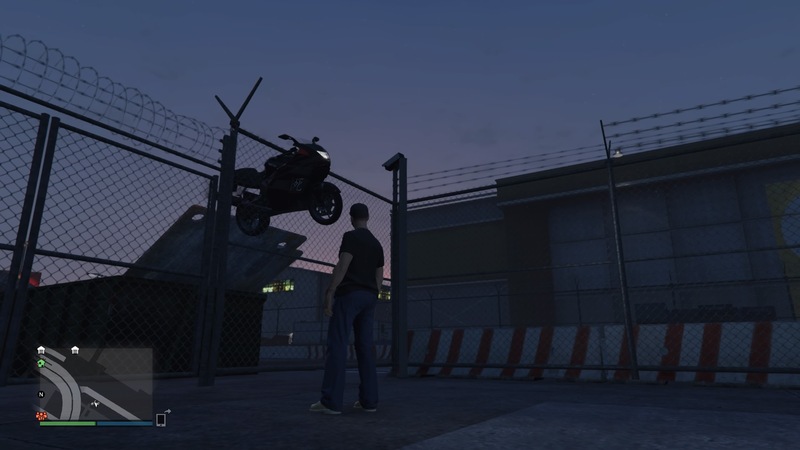 One of my most favorite stunt jumps in the game happens to be on the freeways in Los Santos. It is located in the downtown area at one of the big interchanges. The exact location is when you’re on the 5 freeway, also known as the La Puerta Fwy, and then head towards a big ramp to get onto the Olympic Freeway. On that ramp, you’ll notice that part of the railing is gone and there’s a small ramp that goes right up to the missing railing. You’ll be very high up and the camera will automatically do a cinematic of your jump and descent. They can be tricky, because if you don’t land it right, a message will pop up saying that you’ve failed. Now if you time it right and land on an off ramp from the freeway, you’ll quickly come upon another stunt ramp that you can jump off, but this one is trickier to land correctly as I don’t think I’ve successfully completed it especially since I came off of that other one from higher up on the freeway. There’s also another one that’ll take you right over another freeway known as the Del Perro Freeway. It’s not a real big one and it basically goes to the top of a railing on the freeway. If you get enough speed, you’ll be able to get across the entire freeway, but be warned, if you’re going too fast you’ll go right into a wall! This particular jump is located by the I-5 and I-2 interchange on the lowest part of it. If you’re on the I-5, you’ll probably zip right past it as it is easy to miss. 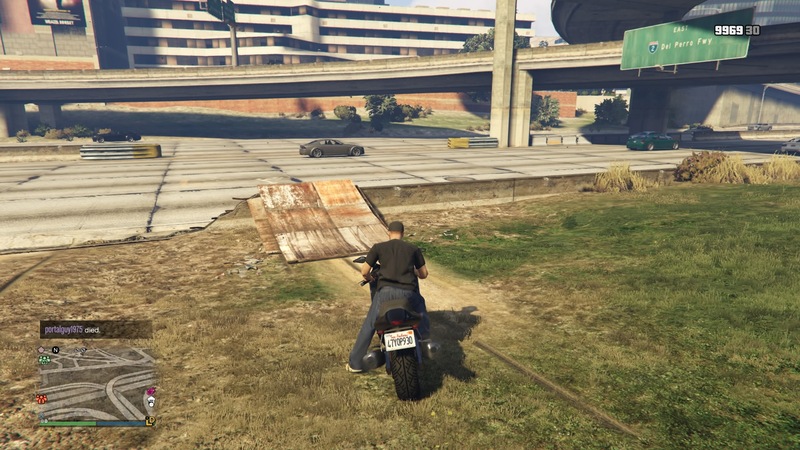 There are some more freeway stunt jumps, but I’ll talk about those in a future post. There are definitely a few of them at the airport with two of them being the same kind just located opposite from each other. Most of them are located on the lower level of the airport. Now you’ll notice what will look like very large skateboard ramps one of which is right in front of a parking garage. I’m sure you’ve guessed that going up that ramp and landing on top of the parking garage will earn you a successful stunt completion. It took me a few tries to complete it, but I got enough speed on my fast motorcycle and got high enough to land on the parking garage. Speaking of the parking garage, there’s another jump up there as well, but this one is far easier to complete though it’s not part of the main stunts located around the map. Still though, it’s fun to jump off of. Now as I said earlier there’s another ramp just like the one that is in front of the parking garage, but it is on the other side as if you’re leaving the airport. I haven’t successfully landed that one yet, but still it is fun to try nonetheless. A third one is near the gate where you can access the hangars where some of the smaller planes are at. You’ll see the ramp just to the right of the upcoming entrance to the runways, but be warned, sometimes the game will glitch here and you might get caught on the fence that you’re supposed to be able to go over from that ramp. Just check out the screenshot below. These are just some of the stunts that I’ve found and have attempted to land successfully a few of which I have already done. You better believe there are a lot more of them scattered about the massive map of GTA 5. There are lot of them in the city, but there are also a number of them located out in neighboring Blaine County especially when you get to the Mt. Chiliad area. I will post more of GTA 5’s awesome stunts soon as you won’t want to miss out seeing me try them out and either crash and burn or land them successfully. Check out the short video below from one of the stunt jumps from the freeway. Has anyone successfully found and completed all of them? What was the worst or most difficult one that you did? If you haven’t already, check out my full review of GTA 5. GTA can almost literally provide hundreds of hours of gameplay. You can spend days just trying to find jumps. And then even more days trying to land that one tricky jump. This guide will definitely help find those jumps, but it’s still in the execution. Looking forward to you expanding the list. Hello Travis! You’re definitely right about the hundreds of hours of gameplay! I’ll definitely post more jumps in the future so check back.